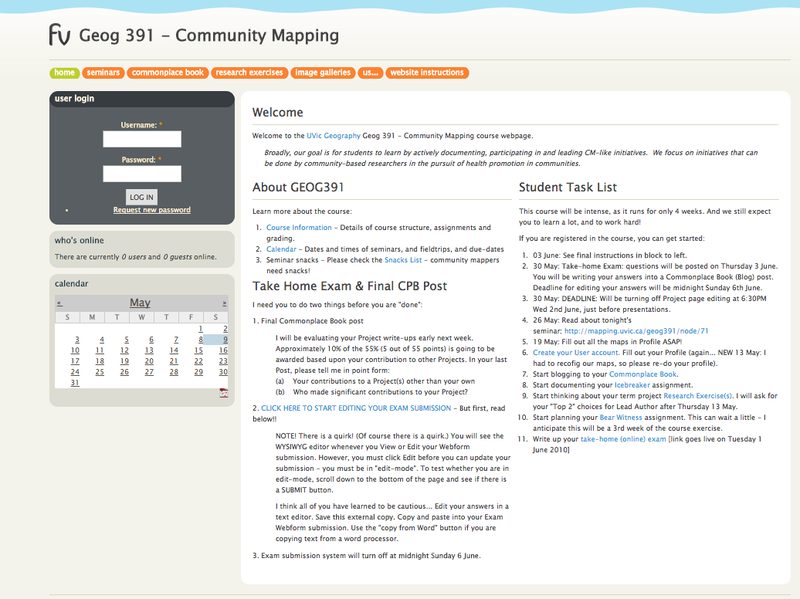 Welcome to the UVic Geog 391 - Community Mapping course webpage. Broadly, our goal is for students to learn by actively documenting, participating in and leading CM-like initiatives. We focus on initiatives that can be done by community-based researchers in the pursuit of health promotion in communities. With thanks to the Department of Geography and the Office of Community Based Research, Ken Josephson, the Geography department cartography technician, will be spending a little time with us. Ken has been leading the UVic Community Mapping Initiative. Updates to this Outline and a detailed seminar calendar are available, and you may start preparing for your term projects immediately. Community Mapping is both a catch-all phrase used to describe community-based participatory processes (mapping, planning, engagement, community building), and to describe a specific method of engagement used in the Greater Victoria region by Common Ground and the UVic Community Mapping Initiative/Centre (http://mapping.uvic.ca) and others. In this course, we will explore both of these interpretations with a focus on the following theme: “community health in small communities”. Broadly, our goal is for students to learn by actively documenting, participating in and leading CM-like initiatives. We focus on initiatives that can be done by community-based researchers in the pursuit of health promotion in communities. We’ll cover both why and how the spatialization of a community’s issues works to strengthen a community. On the ‘why’ side, we’ll explore theoretical concepts including assets-based versus gaps-analysis; community-based versus institutionally-driven, bottom-up mobilization factors, holistic versus reactive views on community health, spatial thinking, collective creativity, open data access, transparency, web-accessibility, social networking, security models, and personal investment/ownership/buy-in. For ‘how’, students will plan, document, facilitate and record a range of engagement processes. The course will follow a seminar format with guest speakers. We will also try to involve “community guests” in the course by having community groups come into the classroom and work with students. To develop practical research, writing, and presentation skills. Students are asked to create a personal "blog"post after each seminar/field trip. Posts should archive your ideas, thoughts, links, useful material, feedback for instructor, on the material discussed in the session. For example, the activity may have reminded the student of a resource or website that is germaine. These Commonplace Book posts will NOT be public, but the instructor and TAs will check that you are writing them. You will use them in your Term Paper (see below). Read more about Commonplace Books. *Commonplace Book posts to be submitted online within 24 hours after each seminar: grading... not submitted, +0% credit, submitted +1% credit. One of the course goals is to give students a chance to try their hand at facilitation. Students will be asked to document, lead and report on an icebreaker of their design. Icebreakers that are ‘spatial’ are desired, of course. Creativity is encouraged. Students will work all through the course on their online documentation of a "DIY Community Research Exercise". We will try to use some of these 'recipes' in the class. Students must speak with the instructors during the first week of the course (or before) and choose an exercise to document. Students will be given one mark each for their exercise documentation, but may assist each other. Please go to the Research Exercises Page to see possible projects. Students may also suggest a topic not included in the list. Students will interview one (or more) on-campus member of the UVic community and summarize the interview(s) into a web page (one interview per post) linked off the "Bear Witness" panel (with interactive community map). You are encouraged to ask "What makes the UVic community healthy?" and to place your interview icon on/near a spatial location of there answer. Images welcome. You can use the common 'interview' icon, or create your own. Students will summarize their thoughts and experiences from the course into a final term paper. On the last Tuesday session (1st June) of the course, students will be given the 'terms of reference' for this document. You will have until NOON of Monday 7th to submit your final paper/exam. Term papers will be submitted on-line through this course website. Maximum 1500 words (approximately 6 pages). We will be visiting Woodwyn Farm to learn about their community mapping needs and to do some hands-on barefoot mapping. If you decide to attend (again, this fieldtrip it is optional), you are responsible for getting there. We will be visiting Wildwood to learn about sustainable forests in the contxt of community planning and non-timber forest products. We will be doing some old-stump/tree surveys and also some edible food collecting/surveys. (b) Who made significant contributions to your Project?